All model Aerite™ AB135, AB150, AB150E and AB180 direct drive centrifugal blowers may be fitted with a specially designed inlet silencer offered as an excellent means of reducing blower inlet noise levels generated by high impeller tip speeds within the housing. 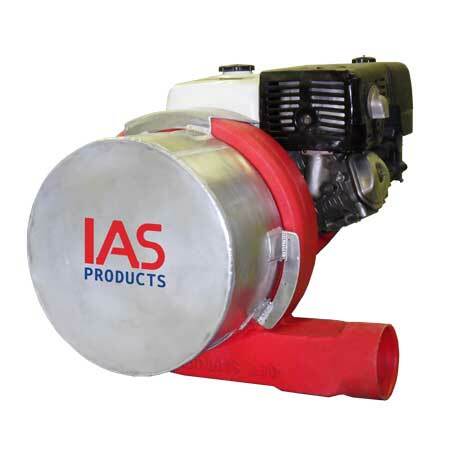 These inlet shrouds are just one optional step in a series of component offerings to address blower operating noise. Aerite™ blower inlet silencers are manufactured using marine grade aluminum components specially shaped and configured to address sound attenuation. All internal faces are fitted with a multi-layered sound deadening material specially designed for this type of application. Inlet silencers are sized to properly fit the front face of Aerite™ AB150 and larger model blower housing inlet faces and are clamped and machine screwed into place using 316 stainless steel hardware. As a general point of reference a 6.0 dB drop of sound equals a 50% reduction in noticeable noise. The use of the Aerite™ Inlet Silencer reduces sound level readings by 5.0 dB while maintaining the high volume air intake rate required to insure proper Aerite™ blower operating performance. The Aerite™ Inlet Silencer is considered an important first step in the sound reduction process and is part of an overall sound deadening approach that includes the use of the Aerite™ Blower Outlet Muffler as well as other sound deadening components such as AeroSpreader™ model sound deadening side panels and blower drive motor exhaust mufflers. Aluminum construction will provide years of service in extreme operating environments. Sound level measurements drop 5.0 decibels based on measurements taken 1 meter (3 feet) from motor/blower operating at 3850 rpm. Assists in complying with government standards for work environment noise. Specially sourced and carefully installed heavy sound deadening material ensures best sound attenuation in a compact inlet shroud package. A less stressful site-operating environment improves operator productivity.